I slept in on Friday, Sept. 29th until 7:15. Well, no, I stayed in bed until then but was awake to the sound of the rain at 6. Clemson and I were cozy so just rested for another hour. What’s the rush to get up on a wet day? I opened things up and made my tea before I texted Bill ‘good morning’. His phone is low on charge, yes, he forgot his charger, so our chats are brief and quick so he can turn it off and reserve power for when he needs it. Hopefully, it will be a short day for him and he is home in good time this afternoon. The wind was up this morning and it rains off and on, heavy and light. Another mixed up day. I turned the furnace up a couple of notches from our overnight sleep setting. Yesterday I pulled up Google Maps and marked out a few rough directions to get us to Nevada. Nothing in stone but a general idea that can’t be jiggled. So, this morning I printed them off and highlighted key points. Today will be a good day to bake a cake for tomorrow and cook a beef roast in the crock pot. While I’m at it, I’m going to make up a batch of steel cut oats for a few breakfasts over the next few days. That is what cool wet weather does to me, makes we want to bake/cook, whatever! Did I stop there? Nope! I remembered that I purchased a used Toastess waffle/panini maker at the Sally Ann in Hanover a while ago. Today, since I’m plugged in, I’m going to test it out. We don’t eat pancakes a lot but I’ve never owned one of these and if it makes it easy, I’ll keep it. So, I mixed up a batter, enough so I could make breakfast for Bill and I for a day or two. I plugged it in and when the light switched from red to green, poured the batter into the pools. In two or three minutes, no kidding, they were steaming and I lifted the lid. Oh me oh my! I gently lifted the two waffles out onto a plate. I noted that there was NO sticking! I added butter and real home town (Priceville) maple syrup and savoured every bite. Bill will love these, they aren’t as heavy as my pancakes and cleanup is a snap! Well worth the $4 I paid for it. I wiped the edges of Toastess and poured the reserved batter into a fridge container. Could someone please tell me how Mom and even I raised children without this ingenious appliance? No flipping, just heat with no oil, pour and serve. I’m in heaven! Did I say NO sticking? I ate them too fast and didn’t get a picture. Next time! I stepped out with Clemson for nature’s call and walked to the Restroom myself. The sun was trying to poke through and that 11C felt suddenly like 18C. Crazy what a little sunshine does to our life. I cleaned up the dishes inside and as it looks again like rain, I may as well carry on with my inside stuff. With company coming tomorrow and possibly a full house (depending on weather) The Suite needs a good dusting. What a great day for accomplishments! The oatmeal is done and in the fridge, a cake is baked and iced. It is okay that Bill reads this, it is no surprise, he knows he has a special day tomorrow. I’ve dusted the Suite and washed the interior windows. Tomorrow morning Bill will vacuum and I’ll make lasagna up for 10. I’ll have to make a trip into town in the morning for another tin foil pan though since I only have one here. With those things out of the way, I grabbed a sweater and walked very quickly down the lane to the mailbox. I saw the mail lady stop. What a nasty wind, but I won’t complain because I want it out of its system today! Yay! A card that I was waiting for has arrived. It just proves that ‘best laid plans…….’ . 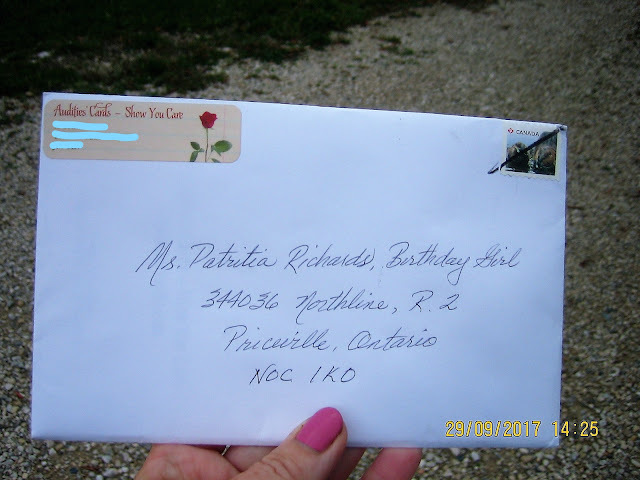 My sister, Audrey, sent my card on Sept. 18 from Montreal and it just arrived, addressed perfectly. It was worth the wait. Bill called at 2 and is on his way home. Yay! His stop at Dad’s found them not home so it will be sooner than later. It is an hour and a half from Stratford. He’ll have time for a snooze before dinner. I hope the roast is done on time. In all this crazy wind and rain, I look out the window and see a couple of funny things. I don't know what is flying over but it looks like a flying fish! The gaggle of geese has returned and are floating around in our front pond as if it is a beautiful day. The other funny thing is our persistent Downy Woodpecker. He is determined to make this tree his own. It is a wonder the strong 60 km winds don’t blow him right off the trunk! Bill arrived home around 4:30 and unloaded the cooler and the groceries as well as his overnight bag. Clemson ran to the door when he realized his Daddy was home. He is the cutest little greeter and needs to be picked up by whoever has arrived home. There it is, the relief I feel when Bill is back. It isn’t often too obvious although I may say to him over the course of the next few hours “I’m glad you’re home”. He left CanAm today for the last time working for them, in their environment at least. He said his goodbyes until we see them in a couple of weeks for the Toronto RV show. Then it will be both of us. I can do it, yes, I can. Thank heavens for Pat and Rob, our little guy will be well taken care of. At 6 I checked the beef and it was done and the potatoes and carrots were tender. Bonus! I couldn’t find the new jar of horseradish I’ve seen somewhere so we had the homemade stuff I made in the fall of 2015. It is good, not hot but it is not creamy, which is Bill’s preference. Oh well, it did the trick with our meal. Supper was good. This was our first taste of West Grey Butcher’s roasts and we were impressed. There is enough left over for a couple more meals and that is enough. We did the dishes up together and Bill sat at his laptop to catch up on his reading. He doesn’t connect to wifi when in London so misses out on not only my posts but other bloggers. The wind is whipping up out there, even stronger than it has been all day. So, once more I’m glad I’m not alone. The flag is almost at a 90-degree angle out there, that should tell you. Bill hooked up our Blue Flame heater and we turned the furnace off. Now we’ll be warm at more than half the cost. This has been a productive day, again, so I won’t grumble about the crazy weather. I just hope that in the morning it will be a different story. I hope your day has been an enjoyable one. Thank you for reading today. I love getting your comments. Windiest rainy day I can remember around here! Yes, I know! Strange day - I hope Mother Nature feels better now that she has released that fury! Tom and the kids always knew when the coolness of Fall hit there would be a roaster filled with a beef roast and veggies cooking in the oven. Still one of my favorite meals. I see you have a tentative route planned that you will be following west. As you know we have had a change in plans and the only thing we know for sure is the first day will be in a southwest direction through Wisconsin. The date we leave, the weather, and our mood will decide the rest. It is a good thing we both agree it is fun "flying by the seat of our pants". Of course, we will also be watching the routes those ahead of us take and the weather they are encountering which is always helpful. The picture of the pond in the rain just totally says fall to me. I love the aroma of a roast cooking and when it is a whole meal in a pot, I love that feeling come supper time! Prep early, relax later. We are praying that things go well for Tom, very positive about it, he is healthy. We to had the weird windy, rainy, love the waffle makers, but don't want one, I would eat too many waffles! LOL. Nice that Bill is back home again and you Blue Flame hooked up again, so efficient and quiet. Glad Bill is home to stay this time until next spring. We love the Blue Flame, toasty last night. The cool, rainy weather reminds me of pleasant aromas coming from the kitchen as well. I am impressed with the waffle maker as well...I was with you when you got it I think. Next week is supposed to be clear to leave time to work outside. Fall is a busy tine of year, even for those of us who aren't 'snow birds'! Love the smell of a roast cooking! You were with me when I bought the waffle maker. Yes, we all seem to have gardens to tend to. Love rainy days, you don't have to feel guilty about staying inside and yes those days make me want to cook too. I have a waffle maker that I love, but it only comes out when the grandkids are here, or when I can't stand it anymore..they're so simple and so yummy..Ken doesn't eat sweets so once in awhile i'll bring it out for me. Dinner looks wonderful! I can smell it from here! :) Lucky you more company!